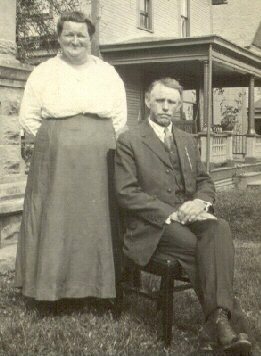 * George Benton and Maude Mae Sisson Fry (1872-1946), of Nankin, OH (pictured below). In July, 2009 we started adding the obituaries of family members, as well as death certificate information. As with this page, the Fry obituary page is organized by generation. More recently, information has been expanded to include other historical records, including land ownership atlases and county histories. The Google search box at the bottom of the page can be helpful in finding specific people on this website, which now has hundreds of items. An update to a century-old photo showing Maude Mae and George Benton Fry's home at what was called the Humphrey House near McKay, OH. The new photo (at the bottom of the page) shows the house as it stood in November, 2008. Each family web page listed below or in the columns to the left has direct links to a number of photos and other documents. 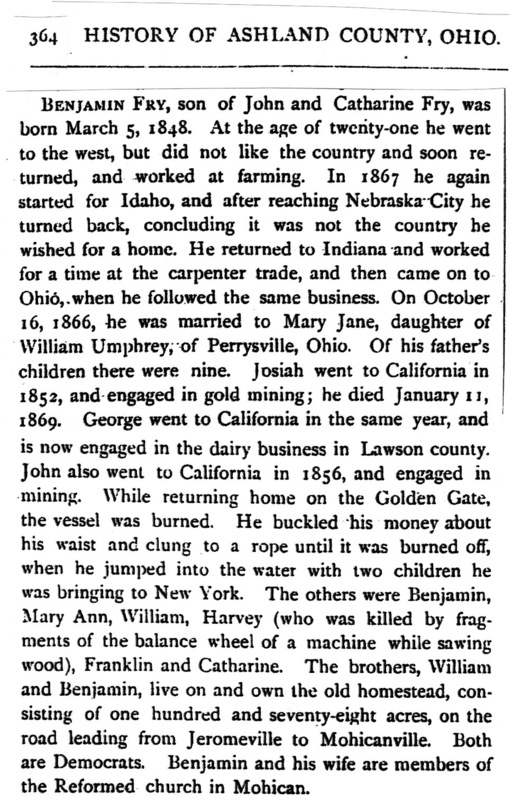 John and Catherine Eberhardt Fry were early pioneers in Ashland County, OH, purchasing 80+ acres from George and Nancy Potdorf in what was then in Mohican Township in January, 1837. At the time the township was in Wayne County. It would be nine years before Ashland County would be formed by carving out portions of four surrounding counties. John and Catherine would add to their landholdings by purchasing an additional 86 acres of land from Henry Beaird and his wife in 1850. 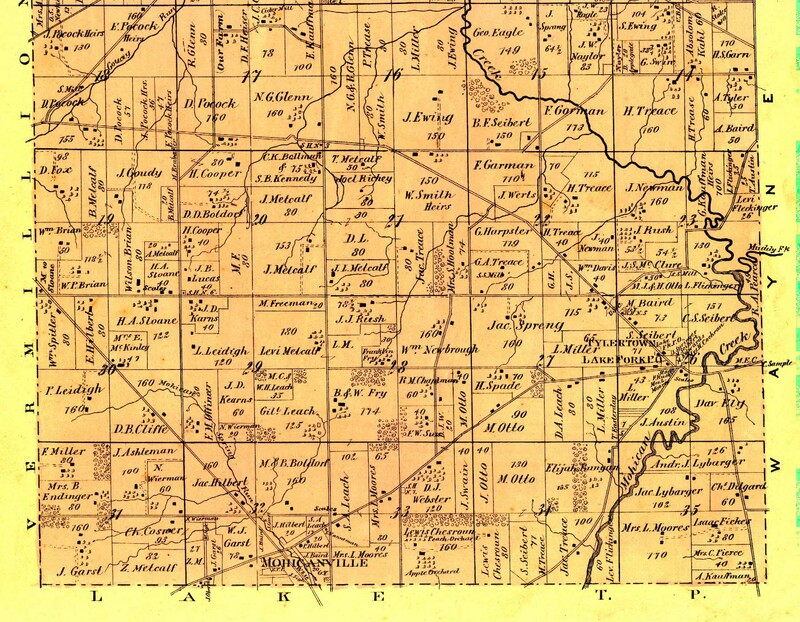 McDonnell's 1861 land ownership map, which shows the ownership of plats in the township and county, places the combined Fry family holdings just north of Mohicanville. It also shows adjacent properties being owned by J. Eberhart (possibly a relative of Catherine) and F. W. Scisson, a name that would figure later in family history. The Ashland County Chapter of the Ohio Genealogical Society has recently posted a larger version of this map that includes Jeromeville. Being a PDF file, you can enlarge it substantially. Note too, that same website has the McDonnell's land ownership maps for other Ashland townships. A later atlas, the Caldwell's 1874 Atlas (p. 104) of Ashland County, shows two sons, Benjamin and William holding the family homestead. Another son, Franklin Fry, is living on a 30-acre piece of land just north of the property. The entire J.A. Caldwell atlas for the county is on the Cincinnati Library site here. John and Catherine were married in Stark County in 1831, her name being registered as "Everhart" in the county records (the family name would also be spelled differently, as "Frye" in their first property purchase). They would have nine children: Josiah (1832-1869); George Washington (1834-1892); John (1837-1862); Benjamin (1838-? ); Mary Ann (1840-1847); Catharine (1843-1869); William (1847-? ); Harvey (1848-1868); and Franklin Pierce (1852-1894). Three of the sons would go to California in the Gold Rush, living in various mining camps. Josiah would apparently die there, possibly as early as 1861. John Fry would perish aboard the SS Golden Gate while returning to Ohio via the Panama Canal route. George Washington Fry would remain in California, eventually being one of the first settlers of what is now Lassen County, near Susanville, CA. He would marry and have both step-children and children of his own. As indicated by the passage of family land into the hands of Benjamin and William, those two stayed close to home (as did Franklin Pierce). While John and Catherine were active in the Trinity Lutheran Church of Jeromesville and John served as a trustee for the church, the two sons were deacons in the Mohican Reformed Church (Lutheran), formed in 1845. Benjamin would marry Mary Jane Humphrey (another variation is Unphrey), another name that shows up commonly in photographic shorthand for many photos of George Benton Fry's generation. Franklin Pierce was the youngest of John and Catherine's children. There are a number of photographs that exist of Franklin and his wife, Nancy Ann Offineer, but relatively little is known about his life. Though there are some indications that he studied (and lived with) with an ordained minister in his twenties, at his death of spinal meningitis in 1894, he is listed as a laborer. George Benton and Maude Mae Sisson Fry were the third generation and the grandparents for many of the cousins who put together this collection of photos. My sister remembers Grandmother Fry suffering from congestive heart failure, called "dropsy" at the time. She was forced near the end of her life at the farm in Nankin to sleep upright in a rocking chair because of it. A copy of George Benton Fry's 1946 last will & testatment is now on this site. Many of the cousins remember at least one of these two grandparents, who often hosted family reunions for their nine living children and their families. George Benton and Maude Mae's surviving children were: Myrtle Irene (1898-1972); Donald Raymond (1901-1973); Montgomery LeRoy (1902-1979); Bernice Lettie (1904-1983); Edna Elnora (1907-1976); Clifford Earl (Jack) (1914-1983); Evelyn Lemoine (1915-1977); Annie Catherine (Nanie) (1916-1974). Three children would die in infancy: George (1908); Vila Levern (1911); and Russel Benton (1906). Several of the children are mentioned in a June 17, 1995 story in the Ashland Times-Gazette story about the Welch School, formerly on Ashland County Road 620. A photo from 1906 class includes Mont Fry, Don Fry, Charles Haun, Myrtle Fry (Haun) and teacher Sarah Ellen Donley. The Welch School, part of the Orange District School System in Ashland County, OH was dismantled after the 1927 school year. Photos on this page have been contributed by a variety of cousins, including the late Doris Samples, Donna Fry, Vicky Forbush, Andy Czernek and Patti King. Major recent additions have been made, thanks to the work of Greg Markel. They have been made available to all for download, as this is the easiest way to distribute them. There is substantial additional family information, including a family tree and other documents, available on CD from the webmaster. Additional photos would be appreciated, whether identified or not -- and either as raw photographs or scanned images. We are trying to get as many of these old pictures archived while there is still a generation of cousins that can identify aunts, uncles and grandparents who appear in the photos. Again, please contact the webmaster, Andy Czernek, for advice on handling them and for a mailing address. It is a wise idea to print and keep both photos and web pages. Web servers can crash and webmasters don't live forever, so information that's been available on the Internet for years can suddenly disappear. Increasingly, we're loading high-definition images scanned at 600 dots-per-inch (DPI), for high-definition photographs. This has the disadvantage of making them slower to load but has the advantage of producing a photo that can be printed by any film processor, including Yahoo! Photos, Shutterfly, Snapfish or even your local drugstore or Kinko's. This link has information on using Kinko's photo print services, but many drugstores now have similar photo stations. I'd highly recommend either using a CD or a USB memory stick. The latter would allow you to edit photos and do some tasks, like smoothing cracks or tears, then save the improved image.